Reasoning and visual processing speed are key skills to incorporate into the cognitive and communication evaluations, as both are indicators for success in completion of instrumental activities of daily living. Lisa Genova's novel Still Alice describes the initial response to receipt of Alzheimer's diagnosis as, "taking Aricept and Namenda felt like aiming a couple of leaky squirt guns into the face of a blazing fire. "1 While there are many antidepressants available, it is difficult to believe that any single one can improve the outlook of persons with early stage dementia, who often possess awareness of losing their sense of self. The overwhelming nature of the diagnosis and its ensuing devastation on all aspects of life can halt a person's momentum. In the May 2015 New York Times Magazine article "The Last Day of Her Life," Sandy Bem's family and friends support her when she vows to end her life before Alzheimer's disease robs her of her memories and self.2 The article illustrates a heart-wrenching wish that many with early stage dementia face. For some it is a fleeting thought or impulse. For others, it is a well thought out decision and multistep plan as an individual with early stage dementia maximizes use of some preserved executive functions. In either case, persons diagnosed with Alzheimer's disease begin the fight against time and the negative effects of tau and beta amyloid buildup throughout the brain. As we await consistent, effective medical treatment for dementia, speech language pathologists facilitate positive impacts on the quality of life for persons with dementia and their caregivers in the face of one of the most devastating diagnoses and life events of our time. 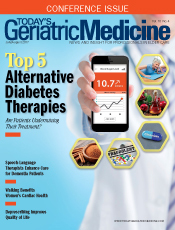 This article outlines the benefits of speech-language pathology services for persons with early stage dementia, noting functional progress, positive patient outcomes, guidance for caregivers to enhance communication, and promotion of safe independent living for as long as possible for individuals with early stage dementia. An SLP focuses on working memory, as it is a representation of a person's new learning capacity. It details the ability to gain and retain new information, retrieve memories, "shift gears," and function independently. To assess working memory and new learning ability, it is valuable to utilize tools and subtests that evaluate immediate and delayed recall as well as recognition (selection of targeted stimuli from a choice of correct and incorrect information). Another important memory type in the evaluation of individuals with early stage dementia includes procedural memory, which is memory for motor routines, basic and automatic activities and habits, and memory for how a task is performed. Some examples include playing the piano, tying a shoe, starting a car, riding a bike, and writing with a pen. A person with procedural memory may be able to defeat you in a game but may be unable to tell you the name of the game or how to play. The widespread question, "Can dementia patients learn?" remains a hot debate among cognitive clinicians, including speech pathologists, occupational therapists, neuropsychologists, and physicians. An SLP's assessment of new learning capacity is comprehensive and therefore yields development of a clinically appropriate and effective treatment plan. Because early stage dementia appreciates some new learning ability, the door remains open for a multitude of traditional as well as advanced cognitive treatment procedures and compensatory strategies. Instrumental activities of daily living that may be incorporated into treatment if they are part of a person's typical daily schedule or interests include medication and money management; shopping; scheduling appointments; way finding; reading newspapers, magazines, calendars, and maps; using a phone or tablet; watching television; listening to a radio; and using a remote control. 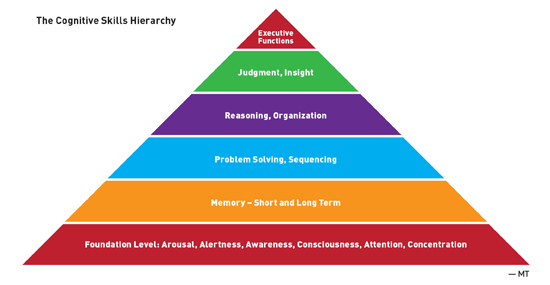 It is advantageous to analyze each task by identifying which primary cognitive skills (see The Cognitive Skills Hierarchy) are warranted for effective activity completion. For example, way finding tasks require visual memory, visual attention and concentration, problem solving, and spatial processing abilities. It is also helpful to consider an individual's familiarity with the environment, the prominence of landmarks, and layout of the environment. An SLP implements the spaced retrieval technique, as it is clinically appropriate for the early dementia population due to preserved new learning at this juncture. Spaced retrieval can be used to attain treatment goals related to compensatory strategies for mobility, activities of daily living, and swallowing; safety precautions; adaptive equipment and ambulation devices; call bell system; and environmental orientation aids. The technique can reduce behaviors such as repetitive question asking and, in turn, may increase independence and reduce anxiety. Additional treatment techniques appropriate for trial with early stage dementia include visual imagery, mnemonics, acronyms, associations, rehearsal, repetition, redirection, and reality orientation.8,9 An SLP can assist with additional unique considerations related to early stage dementia including driving, holiday routines, and employment. The evaluation of functional and quality-of-life outcomes continues to emerge as a vital component of state-of-the-art health care. Specific to the field of medical speech-language pathology, any discussions pertaining to dementia and/or dysphagia bring quality-of-life issues to the forefront. Dysphagia as a sequela of dementia is understood to create significant negative impacts on quality of life due to the challenges associated with its management in persons with progressive degenerative neuropathology and the resulting cognitive, sensory, and motor decline. Most recently, the field of swallowing and swallowing disorders has highlighted the significance of ensuring preservation of both swallowing safety and quality of life in those diagnosed with dementia. The difficulty remains in determining the most appropriate protocols for assessment and management of the swallowing disorder. Diffuse cortical damage and subcortical involvement are consistent with the diagnosis of dementia and lend themselves to a heightened risk of impaired swallowing function. Unfortunately, given the complex and variable neuropathology associated with dementia, swallowing management is often complicated by the need to carefully balance swallowing safety with quality of life. 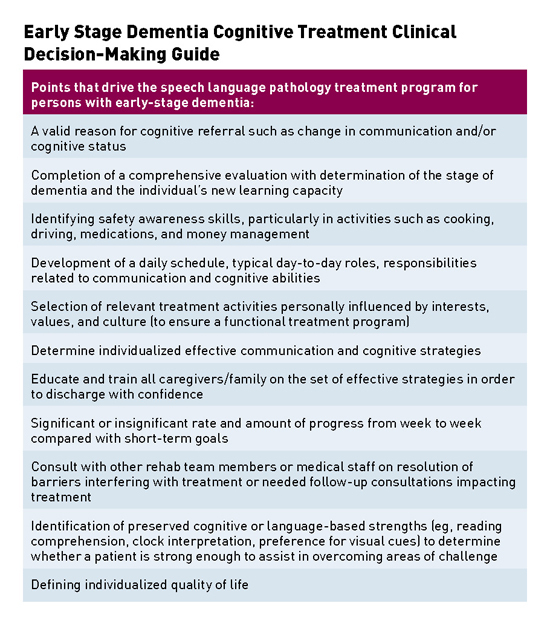 Although to date there is no gold standard for managing dysphagia in persons with dementia, SLPs often utilize comprehensive clinical reasoning skills to tailor effective recommendations to the unique needs of the individual. • management of cognitive-based dysphagia: oral acceptance, oral apraxia, and oral preparatory compensatory techniques and adaptive equipment. A multitude of techniques may be utilized in addition or as alternatives to diet texture modifications. A clinical pathway to preserving quality of life for persons with the dual diagnosis of dysphagia and dementia must include balancing the risks and benefits associated with both artificial nutrition and hydration and nutrition and hydration by mouth. This clinical pathway can include a comprehensive dual diagnosis assessment and implementation of compensatory techniques. An SLP offers a safe, effective, and dignified alternative to artificial nutrition and hydration and reduces the use of nothing by mouth recommendations as appropriate. The complexity of conducting a comprehensive assessment of the swallow mechanism and overall intake of foods in this population cannot be sufficiently stressed. The opportunity to generate an extensive and positive impact for the vast population of persons with advanced stage dementia is very apparent. An SLP plays an important role in preserving communication and dignity at the end of life. He or she maintains quality of life for persons in the final stages of life by facilitating verbal and/or nonverbal communication of last wishes and expressions, answering questions related to hope, fear, pain, and spirituality. Determining the most effective mode of communication is paramount to the patient and those surrounding him or her at the end-of-life stage. Augmentative and alternative modes of communication, both high and low tech, writing, valves, caps, and electrolarynges (for tracheostomized or laryngectomy patients) are all options that an SLP can investigate. All communication avenues must be explored to "say what needs to be said" at this important time. People who are experiencing signs of nearing death awareness may appear confused and disoriented; state that they have spoken to those who have already died; speak to people and see places not visible to others; describe spiritual beings and bright lights; talk aloud to people who have died before them, such as a mother, father, or close friend; tell exactly when they will die; or make hand gestures, reach for or hold unseen objects, or wave to unseen beings. These behaviors do not mean that they are confused, hallucinating, or having a reaction to their medications. It is believed that such behaviors signal the beginning to transition from this life. A person may be trying to describe the dying experience or something he or she needs to do before dying. SLPs are experts in evaluating and implementing the most effective modes of communication. Furthermore, SLPs can assist the interdisciplinary team in determining a patient's capacity to make medical decisions; express personal preferences; describe alternatives, risks, and benefits; and manipulate information rationally. An SLP completes a comprehensive and standardized cognitive assessment and presents results to the team to add to the overall picture of decision-making capacity. In conclusion, involvement of an SLP in the care of geriatric patients is a vital component to patients' quality of life. Whether SLP services include communication, cognition, and/or swallowing assessment and management, the contributions delivered secure enhanced positive outcomes across all geriatric settings. — Michelle Tristani, MS/CCC-SLP, a member of the Gerontology Coordinating Committee for the American Speech Language Hearing Association, is a regional director of resident services with Benchmark Senior Living. She has worked for Kindred Healthcare as the national rehab clinical specialist for speech-language pathology. Having practiced across the continuum of care from acute care to short-term rehab to long term care, she has specialized in adult and geriatric cognitive disorders and presented at many workshops, conferences, and seminars focusing on Alzheimer's disease and related dementias, assessment and management of cognitive disorders, swallowing disorders in cognitively impaired patients, speech pathology services in tracheostomized and ventilator-dependent patients, palliative care, and professional/workplace etiquette. 1. Genova L. Still Alice. New York, NY: Pocket Books; 2009. 3. Raia P, Koenig-Coste J. Habilitation Therapy: Realigning the Planets. Alzheimer's Association Massachusetts/New Hampshire Chapter; 1996. 4. Joubert S, Brambati SM, Ansado J, et al. The cognitive and neural expression of semantic memory impairment in mild cognitive impairment and early Alzheimer's disease. Neuropsychologia. 2010;48(4):978-988. 5. Brandt J, Aretouli E, Neijstrom E, et al. Selectivity of executive function deficits in mild cognitive impairment. Neuropsychology. 2009;23(5):607-618. 6. Mansbach WE, Mace RA, Clark KM. Story recall and word lists: differential and combined utilities in predicting cognitive diagnosis. J Clin Exp Neuropsychol. 2014;36(6):569-576. 7. Willis SL, Tennstedt SL, Marsiske M, et al. Long-term effects of cognitive training on everyday functional outcomes in older adults. JAMA. 2006;296(23):2805-2814. 8. Hampstead BM, Stringer AY, Stilla RF, Giddens M, Sathian K. Mnemonic strategy training partially restores hippocampal activity in patients with mild cognitive impairment. Hippocampus. 2012;22(8):1652-1658. 9. Clare L, Woods RT, Moniz Cook ED, Orrell M, Spector A. Cognitive rehabilitation and cognitive training for early-stage Alzheimer's disease and vascular dementia. Cochrane Database Syst Rev. 2003;(4):CD003260. 10. Callanan M, Kelley P. Final Gifts: Understanding the Special Awareness, Needs, and Communications of the Dying. 1st ed. New York, NY: Simon & Schuster; 1992.